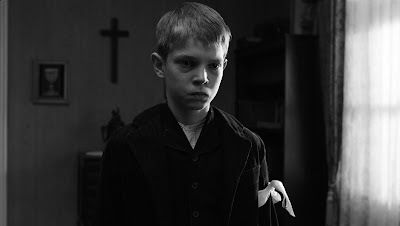 The best new work I've seen at the festival so far is Michael Haneke's Das weisse band (The White Ribbon). That shouldn't surprise me too much since it did win the Palme d'Or at Cannes this year. 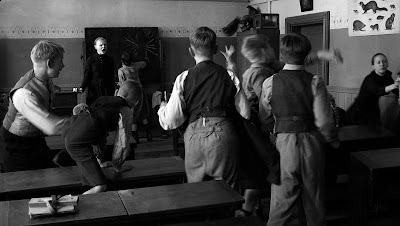 The film is a meditation on the cycle of violence that begets more violence in a small German village just after the turn of the (20th) century. Handsomely mounted in crisp black and white, part of the reason it is so remarkable is because of Haneke's deftness at eliciting consistently strong performances from his entire cast. Not that one shouldn't expect it from a major director, but when the cast is as large as this one, and a significant portion of the actors are very young children, it is even more conspicuous. The film's story is told by a narrator who freely admits how unreliable he may be in his recollection. This narrator is the village schoolteacher (Christian Friedel), who is the one person in the story that has a unique perspective for a few reasons. First he is one of only a handful of characters that come from outside the village; second, he is the only character that knows not only the townspeople very well, but as the teacher he has unique insight into the children and their interactions with not only him, but other adults, other children and their community as a whole. The idyllic village soon loses a bit of its innocence after a prominent doctor is thrown from a horse in an apparent accident. Apparent because, as it turns out, the horse was felled by a long, almost imperceptible wire strung between two trees in the horse's path. As more and more mysterious accidents occur, as they get more grisly, as each act starts to have a ripple effect that begins to engulf the town, the viewer begins to realize how the town is locked in a downward spiral with little hope that it shall ever escape. In all honesty, it would be difficult for me to assess Das weisse band in the context of Haneke's filmography since unfortunately I haven't seen any of his previous films. I know of his oeuvre well enough to say that occasionally he can be a bit mischievous in the same way von Trier can be, like he was in the original Funny Games (1997) and the 2007 American remake, both directed by him. So I was surprised that Das weisse band is such a restrained picture. One can almost imagine the film is by another great European director. In many ways it is reminiscent of Bergman's films. 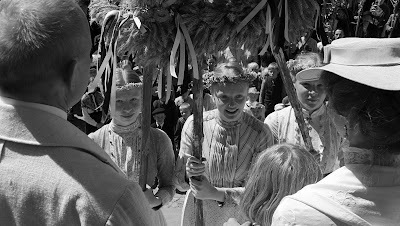 Bergman's explorations into the darkness of the human psyche were subtle and not without some humor. But one largely forgets that there could be innocence at the heart of his movies which often made it seem as if the encroaching horrors were even darker by comparison. Friedel's schoolteacher, his paramour—a nanny, also from outside the village—and the youngest children are the only ones that seem to escape relatively unscathed from the evils that surround them because of their inherent nature as outsiders from the social interactions of the community. If you find this writer dancing a bit around the substance of this review, it is because this disturbing film is at its strongest when one doesn't know the intricacies of its plot. As each of the film's relatively minor revelations pile up, the effect is cumulative. And if the film's open ending leaves you unsatisfied, just remember that in life, too, the cycle of violence never stops advancing. Oh man. You have GOT to see CACHE. no, watch the Glaciation Trilogy first. Benny's video is like (one of) the best movie of the 90s.